It's always difficult to come up your favorite of something when you're passionate about the medium. Favorite movie or music or book... Difficult. 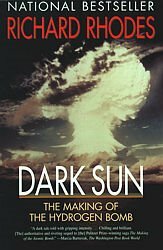 "Dark Sun: The Making of the Hydrogen Bomb" by Richard Rhodes is a book that fights tooth and nail for first or second place in the nonfiction category. Which book is it fighting with? "The Making of the Atomic Bomb" by (you guessed it), Richard Rhodes. I'm just in utter and complete awe of these two books. The amount of research that went into them is just staggering. Rhodes manages to present a beautiful and engaging story with an obscene litany of characters in a highly complex setting. This guy did some serious work to write these books. I can't praise these books enough. These are two books for repeated reading. There is just no obvious way to take in all this information in one go. I'd probably give the nod to the first book which won the Pulitzer Prize in terms of sheer enjoyment. But they are both equally well written and researched. While the first book focuses more on the logistics and process of creating the atomic bomb from an American perspective (obviously), the second book focuses more on the politics between the U.S. and Russia as well as the two hydrogen bomb projects. For anyone without a good understanding of the things that led up to the Red Scare and the arms race, this book helps. I was struck by a couple things which weren't evident to me before. The paranoia of communism (Red Scare) in the U.S. during the 40s and 50s had always seemed to be borne out of a witch hunt mentality given what I know about McCarthy, the Rosenberg executions, etc. But the fact pointed out in the book is that there was a serious amount of industrial and military espionage going on in the U.S. by communist sympathizers. It's not too hard to see how the paranoia came about regardless of whether it was handled legitimately. The speed with which the Russians completed their first atomic bomb was a direct result of an efficient spying infrastructure. I also used to think about communist sympathizers in the U.S. as probably some small group of marginal characters. But Russia was an ally during WWII and as a result many Americans offered some type of help to Russia. And many of the sypathizers (at least the ones the book talks about) were Jewish and for quite clear reasons. The U.S. wasn't exactly exempt from the type of persecution that Jews received at the hands of the Germans. It wasn't as violent and systematic of course, but the U.S. didn't have clean hands. The Russians on the other hand, at least in rhetoric, were more embracing of the Jews. Many spies simply felt they were helping a regime that supported them and needed help (having had quite few odd million of its populace killed by the Germans). It doesn't seem that it occurred to many of these people that they were necessarily working against the U.S. because Russia was an ally fighting against the Germans and the whole concept of the Evil Empire and the Cold War of course had not started.